“I’m Jewish!” yells Benjamin, adorning a cape, as he soars among his classmates on the playground. 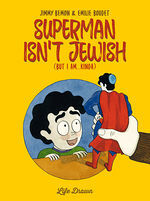 Convinced by his father that Judaism is some kind of superpower, Benjamin believes that each of his eccentric, Jewish relatives is a superhero in their own right, and that he is sure to follow suit—that is, until he realizes that being “different” has turned him into a Bizarro among his classmates. Humorous and timeless, this personal and poignant story of inherited identity will resonate with everyone, especially those who have experienced the trials and tribulations of Interfaith unions. Benjamin would always proudly say, "I'm Jewish. Like Superman!" Assuming that Judaism is some kind of super power and Hebrew is akin to the Kryptonian language, Benjamin believes each of his family members is a superhero. Until, like Krypton, his world is shattered. After learning of the link between being circumcised and his religion, Ben decides to hide his heritage from everyone. Caught between the desire to avoid disappointing his Jewish father and his desire to understand his Catholic mother, Ben has to find a way to abandon his secret identity for a very public one. Humorous, timeless and universal, this personal and poignant story of acceptance and understanding shows how we all must learn to love the hero within ourselves. "The full color illustrations by Boudet are bright and cheerful...recommended for synagogue and school libraries." "...his internal conflict is something that all readers will recognize." "...an impressive graphic memoir that explores self, religion, and pop culture. The story by Bemon is heartfelt, humorous, and relatable. The art by Emilie Boudet transports the reader to a different world. Altogether, it’s a story which gives readers affirmation that being different is a superpower. " A humorous, poignant journey of acceptance and learning to love the hero within ourselves. "Humorous, timeless and universal, this personal and poignant story of acceptance and understanding shows how we all must learn to love the hero within ourselves."